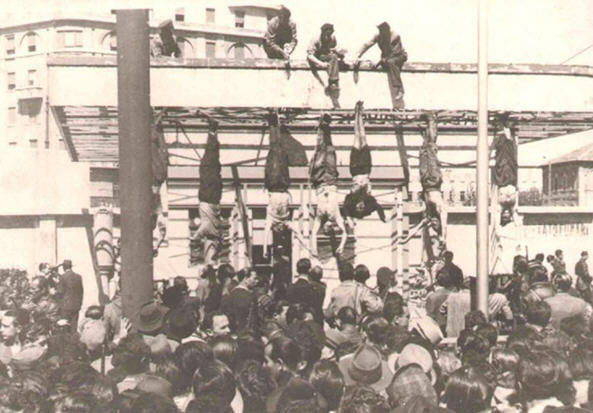 Muammar Qaddafi’s death yesterday in some ways resembles that of Mussolini in 1945. 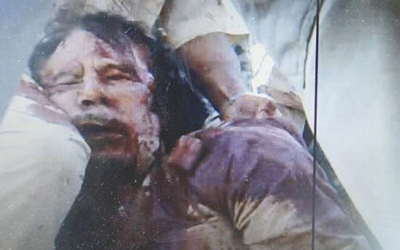 Like Mussolini, Qaddafi was captured alive then executed by militias fighting his regime. Like Mussolini, too, his body was exhibited with much rejoicing by the victors. Let me suggest one rather large difference between the two events, however. Mussolini died in a world ruled by the printed word. Iconic photos exist of his corpse, strung up by the heels, but for his capture and last moments we must rely on textual accounts. In contrast, Qaddafi spent his last moments in front of a battery of cell phone cameras, which produced a crazy quilt of videos and stills partially documenting the dictator’s panic, humiliation, and bullet-struck corpse. Qaddafi died in the age of the image, and images of his death are now reverberating across the Middle East and the world. One reason for a public death is to reassure the public that the death has in fact occurred. Qaddafi had been defeated months ago, but his survival loomed monstrously over Libyan political life, and his death still packed immense political impact. 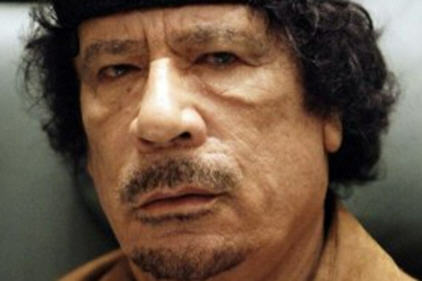 Not surprisingly, then, the early images were of a dead Qaddafi: first, a gruesome portrait, scarcely recognizable, then a video clearly showing his lifeless face and upper body, covered by a sheet, prone on the ground. The National Transition Council, a fairly anarchic umbrella group now attempting to govern Libya, never got out much of a story beyond the happy news that the dictator was dead. Journalists at first wavered between reporting a capture or a death, but the video settled the matter: by mid-morning Thursday, with Al Jazeera in the lead as usual, the news media proclaimed Qaddafi’s demise. 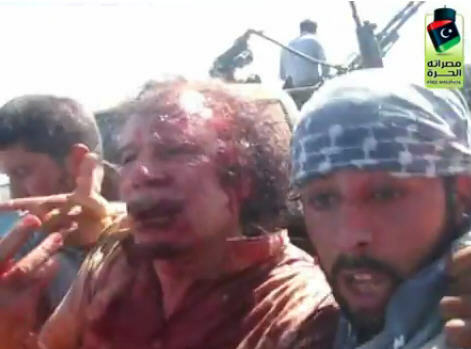 Almost immediately after, several cell phone videos surfaced showing Qaddafi captured and alive. It’s powerful stuff. The jerky motion of the cell phone cameras conveys a feeling of violence and excitement which mirrors the action in the videos. Objects swirl wildly around, fixed in their meaning by glimpses of the doomed dictator. The background music of human screams is dizzying. One never hears Qaddafi speak, only the strident voices of the young warriors from Misurata who hold him in their power. We will probably never learn exactly what transpired outside Sirte that Thursday morning, but some of the stories now being told sound too good to be true. Qaddafi, who had sworn to fight to the death, fled his besieged hometown instead. Stopped by NATO air power, he hid inside a “drainage pipe” – essentially a sewer. According to the young man who claimed to have captured him, he was carrying a pistol made of gold, another of silver, and a bag of charms. “What’s happening?” he is reported to have asked of his enemies. Good question. What happened was the visual transformation of a once-feared and much-flattered despot into a frightened, helpless prisoner. He had been one with the Assads and Saddam Hussein – the small circle of truly ruthless Arab rulers – but he became a creature crouching in a sewer. It is still too early to know what effect the intermittent images of this metamorphosis will have on his fellow dictators and the Arab public: how they will expand the range of the possible, how they will influence ideas and actions. But this will happen. Compared to Tunisia and Egypt, the Libyan revolt was a sort of experiment. We didn’t know whether an autocrat willing to kill untold numbers of his citizenry could be overthrown. We now have the answer on YouTube, can see it with our own eyes: and visual information, though ambiguous, is always powerfully persuasive. My father thought YouTube was inexplicably silly, until I showed him the videos of Saddam’s hanging. His only comment was “play that again…” He was stunned by the power of those few clips, posted for all the world to see. Your post , as always, is excellent. Great point about the power of images to dispel disbelief about the fate of a dictator, terrorist or whatever or whomever. In Pakistan many people still don’t believe OBL is a gonner because they never saw any proof with their own eyes. Awesome.. Now Al-CIAda is in control there… Good job..